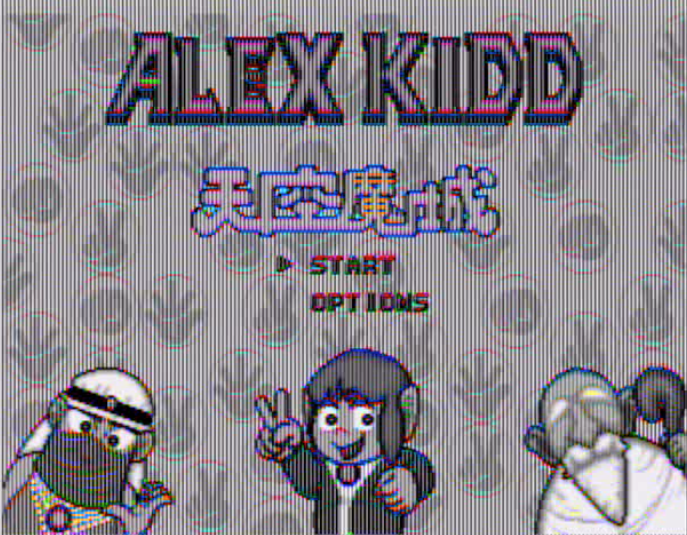 The games were: Dangerous Seed, Puyo Puyo 2, Ex-ranza, Forgotten Worlds, Alex Kidd in Miracle world…. All black and white >_< or just weird.. so back to square one, trying to figure out how to record a JAPANESE Sega Megadrive onto my iMac..
Alex the Kidd is a classic, just like Puyo Puyo, it just can’t go wrong ^_^ The other games I had never heard of before when I saw them in the auction. A lot of people were bidding on them though, and they started getting a bit pricey, and that just made me want them more ! :D I’m happy that I really enjoyed all of them! Especially Ex-ranza! Amazing shmup! With great controls, fantastically fast movement, awesome music and just great gameplay ^_^ I wish I could have showed you some screenshots, but you will have to settle for an audio clip that I managed to extract of the intro song for Ex-ranza. It’s great! I’m really into japanese Sega Mega Drive games now, I’ve already ordered 12 more from Ebay ^_^ Hopefully they’ll arrive soon, and hopefully by then I will have found a solution to yet another recording problem.. This entry was posted in Music, Nintendo, Sega, Sega Mega Drive, SNES / SFC and tagged Alex Kidd in Miracle World, Dangerous Seed, Ex-ranza, Forgotten Worlds, Music, Nintendo, Puyo Puyo 2, Sega, Sega Mega Drive, Super Famicom, Valken. Bookmark the permalink. ← Pink Game Boy Pocket boxed! Excellent buys there! 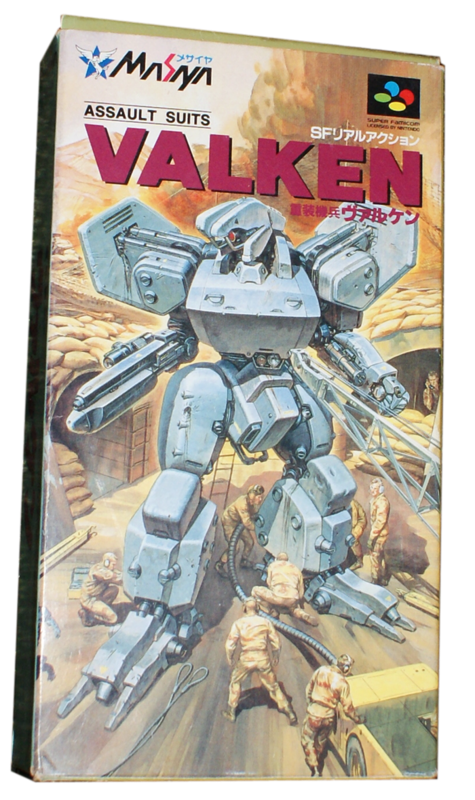 Valken is awesome stuff indeed- a side scroll action shooter that I believe was called Cybernator here in the US. Does your Forgotten Worlds work OK? I have a few of them and for some reason, the cart goes to the title screen and then a GAME OVER screen before I touch a button. I’ve played it before in the arcades and on the Turbo Grafx, so I know what it is and I know you’ll like it (although the MD version isn’t as good as the arcade game). Gotta love Puyo Puyo ^^ I actually played Dr. Robotnick's Mean Bean Machine before ever playing Puyo Puyo though o_O I don't know which one was first though.. but I guess Puyo Puyo.. I don’t have Dangerous Seed and but I’ve always wanted it. You’ll have to let us know what you think of it. Forgotten Worlds was one of my favorite games from back in the day. It’s true it’s not quite as pretty as the arcade version but it is a lot of fun. It’s not difficult so it might feel a bit short but still a great game. It’s also two player which is a huge plus. From your picture it looks like Puyo Puyo 2 has a tab on the case. I’ve started noticing that the newer Mega Drive games have these. It’s interesting that Sega of Japan made this switch so late in the game. I always love the tab free cases. They’re so much easier to stack and display. 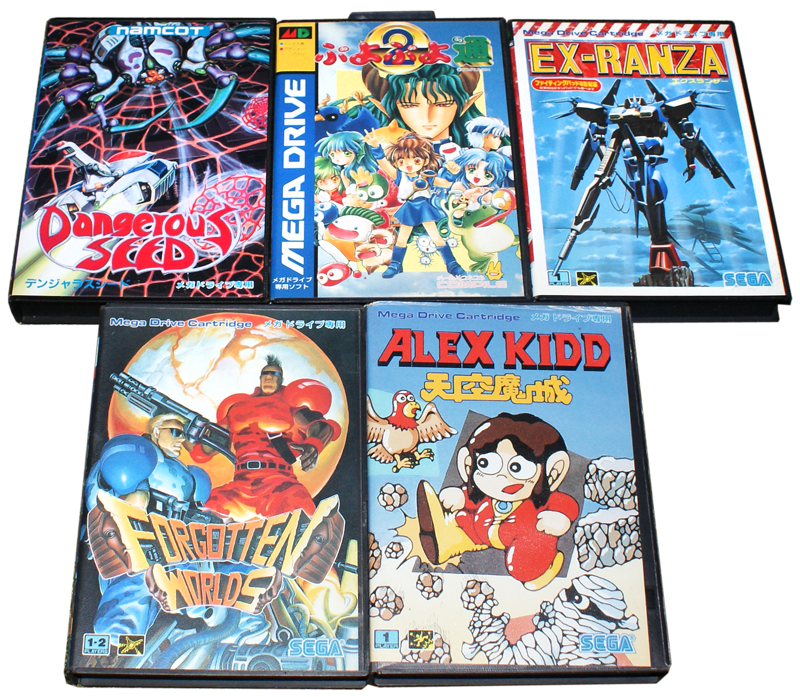 After you next 12 games arrive I’d love to see an updated picture of your Mega Drive games in the collection! Dangerous Seed is good ^_^ Ex-ranza was better though, but they’re completely different games.. The new order of games were shipped today! wohoo!! The ebay store Hit-Japan pretty regularly sells lots of 100 Mega Drive carts for $100. That many carts might cost a fair bit in shipping… but it is 100 games! Keep an eye if you really want to dive in. Thanks for the suggestion :) It seems those bins usually contain mostly junk, from what I’ve seen, lol. But I am familiar with the seller. By the way, do I need to import Japanese consoles too? Or what other convenient way do you play Japanese games (on PAL…)? Never seen that bundle though.. but the shipping probably wouldn’t be worth it since it’s probably mainly crappy games..? I can’t change my comment so I’ll just add another one, perfect at 3 AM. Anyways I had to check out the auctions you won, wow, if I knew I could sell them for those prices I would buy, haha, but it’s difficult if you don’t know… takes time.. Most Japanese Mega Drive games are region free. It seems to me that only the later games (some of the last released) are region protected. I would guess that 90% of Japanese Mega Drive games are region free and play fine. Keep in mind my only experience is in playing Japanese Mega Drive games in a North American model 1 Genesis. I’ve never tried in a PAL Mega Drive. But if I were to guess the same is true for PAL. nope.. I tried it and the Japanese games didn’t fit in my PAL Mega Drive. I also tried playing a PAL game on my Japanese Mega Drive and that didn’t work either.. :( But at least I have both region consoles now so I can still play both ^_^ I haven’t tried the NTSC ones though.. I just read in my list that I have an NTSC Sega Genesis in my possession! I wonder where it is…..
stopxwhispering! You’re right! I completely forgot that my Genesis has it’s slot opening shaved so that it’s a little bit wider. Wide enough for a Japanese Mega Drive cart to fit. I’m still using my original Genesis from back in the day and I completely forgot about the size difference in the carts. For the Genesis nothing else is needed except to make the opening wider. No electronic changes are needed. If you have more than one PAL Mega Drive maybe you’d be willing to try. If you have a dremel I bet you could do a really nice neat job at it too. Hey guys – you know you don’t have to butcher your consoles unless you have an extra one or don’t mind taking a hot X-Acto knife or Dremel tool to deface it. And yeah, Hit-Japan IS awesome, aren’t they? I have a super key myself and from seeing them from time to time they don’t seem to very cheap. But you’re right it’s a good solution. Would a Game Genie do the same job? I do like the idea of cutting the slot opening for a more perminant fix. But I don’t have much experience with a PAL Mega Drive and NTSC games. For me the slot carving has worked very well. I actually have two Game Genies around here in a crate full of accessories (one of too many crates, actually! ), but I’ve never used them at all. I think they do work, as I can recall a friend saying he used his when I lent him some loose MD carts I had. Back in the early 90’s on my first Genesis, I actually did take a heated X-Acto Knife to the system to play imports, but that was before I knew about convertor carts or buying an import console (well, Mega Drive systems were really expensive back then to import and I was always broke, soooo). exactly! :D I’ll have to start looking for one of those!! I only have one of those converter cartridges for my SNES.. but it only works for the NTSC games (on my PAL system). no.. :( I don’t want to “destroy” (even if it is to enhance) my systems.. I’m the kind of collector that wants to keep everything in its original shape and forms ^_^ I don’t even have a modded PS1, PS2 or xbox lol..
And I already have the PAL and Japanese Sega Mega drives, and according to my inventory list there’s a genesis here somewhere too! Gotta go look that up… I don’t have the correct power supply or an adaptor for it probably though.. I understand not wanted to mod a console. We work so hard to get systems and games in great shape it almost seems backwards to change them! But… but, I do like what some of the mods do. In my case I have a bunch of Gensis and SMS consoles that modding one or two doesn’t feel as bad. To have one that could play any cart no matter does appeal to me. I found an old ebay post that shows one of the auctions that Hit-Japan did for 50 loose carts. I was wrong; it was a lot for 50 carts and not 100 but the shipping is listed as free. So each game is $2.45. That’s pretty good. And if you look close you can see there are many good titles… a bunch are crap too but it’s not all bad. A few highlights are Sonic 1 and 2, Space Harrier, E-SWAT, Hertzog, Puyo Puyo 1 and 2, Ragnacenty, Ecco, and Mystical Defender. If it turns out that those were the only ones worth while then yeah, I guess that’s a bit much at $12 per cart but those large lot auction seem like they’re worth keeping an on. But I’m getting the impression that stopxwhispering is loving nice boxed SMD games too much to settle for carts :) Can’t blame ya. Yes it would be an okay price but I have heard they only show the good games at the top. Selling junk is really tough. I sell junk games for less than 50 cents (incl commission) if at all. And sitting with 50 baseball or whatever junk there is on MD is not too much fun, lol. Also, shipping for those items will take 2-4 months. I wonder if Mega CD games are worth it? Do they require a Japanese system too? They don’t seem too expensive really, I think they might even be cheaper than carts. I hope most games are decent too. HATE sport games >__< damn it! As far as I know, Japanese Mega-CD games require a Japanese Mega Drive/Mega-CD setup. The nice thing about the MCD library is that it’s overall, pretty small compared to other CD-based games libraries and most titles (save for some rarities and key RPGs) can be had dirt cheap. As for the quality of the library… it depends on what you’re looking for and how much of the language you speak. Obviously, RPGs such as Shadowrun, Illusion City, Shin Megami Tensei, Arcus I-II-III, REcord of Lodoss War, Fhey Area and others are no-brainers if you’re able to play them, but there are a bunch of other titles in a few categories that are worth picking up. Also, when it comes to the japanese ones, it’s just too much work trying to understand WTF is going on >_< even though I studied the language for 4 years! Are there any gems (that are NOT RPG's) for the Sega CD that makes it worth picking one up? I have Flink as a cartridge, is there a big difference? … I wish I knew your ways!! cool ^_^ I want it but, I’d still prefer it if they had boxes.. and manuals…. it’s a storage issue.. even though, they DO have labels on the top edge! hmm.. free shipping… But yeah, I doubt that the lot consists of a majority of “great” games..
You’re right about the cases. They feel so much better in the collection when they’re complete :) If Hit-Japan did more of those and said there were no sport games in those loose cart lots I’d be more interested.